A general view of the ancient ruins of the Greek and Roman city of Cyrene, in Shahhat, Libya, Oct. 20, 2018. Graffiti covers the ruins of Cyrene in eastern Libya, a city founded by Greeks more than 2,600 years ago that once attracted tourists but is now neglected and the target of vandals. Insecurity and looting has hit Libya's archaeological sites in the chaos and fighting that has followed the overthrow of Muammar Gadhafi in 2011, as rival groups struggle to consolidate control of the country.Libya is home to five of UNESCO's World Heritage sites, listed for their outstanding universal value. 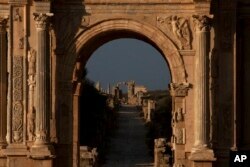 The sites include the ruins of the Roman city of Leptis Magna and Sabratha, which is famous for its amphitheater. 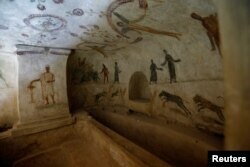 Drawings representing the funerary rituals are seen at Ancient Roman graves date back to the Roman period in Tripoli, Libya, Oct. 18, 2018. "In Cyrene, instead of speaking to one owner, now we speak to 50 with different backgrounds," said Ahmad Hussein, the head of the antiquities department of a parallel administration in charge of eastern Libya. "Some of the owners have built houses on these sites," he said. 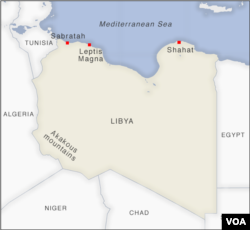 The challenge is worsened by a law in 2013 that allowed people to reclaim land confiscated under Gadhafi. Some people took that literally and annexed what they felt they deserved. FILE - View of the arch of Septimus Severus in the ruins of the old Roman town of Leptis Magna near Khoms, Libya, July 18, 2012. "There is no support for this site," said al-Amari Ramadan Mabrouk, director of the Janzour antiquities office. "I cannot give a number for tourists who visit Libya... but I can say that, before 2011, tourism was popular in Libya," he said.